Two of my greatest passions have come together in this bottle. Something important happened on the hallowed ground of Civil War battlefields that should never be forgotten. Whether it was “home” or “country,” “honor” or “union,” that drove them forward, they fought and suffered, even unto death, for their cause. 150 years after the bloody battle, the legacy of Carnton Plantation lives on, and Battlefield Bourbon has been created to honor the important history of the Battle of Franklin. As bourbon aficionados know, the distillery process includes the addition of water to the matured bourbon as it is withdrawn from the barrel. The water used for the creation of Battlefield Bourbon is fresh spring water from the battlefield in Franklin. The bourbon is incredibly small batch, limited to only 1,864 bottles. When Robert Hicks decided to add ‘bourbon maker’ to his long list of credentials, it seemed to those who know him to be a pretty obvious fit. After all, he has never hidden his passion for brown whiskey any more than he has his passion for the Civil War. What folks know is that when he sets his mind on something there is never any turning back. For many years, Robert served as a partner in the B. B. King’s Blues Clubs across the country and was named ‘Curator of Vibe’ by BB King. So producing a really good bourbon, Tennessee made and Tennessee aged seemed like a logical step forward for Robert. Much thought went into how to connect his passion for bourbon with his passion for battlefield preservation. Out of it has come this rare, small batch bourbon. …And now, maker of a fine bourbon with a real purpose, for with every bottle of Battlefield Bourbon sold, the goal of Civil War battlefield preservation moves that much closer. The late Buzz Davis once told me a story about how when he was a young man, Sam Fleming, banker, family friend and mentor of Buzz’s called him down to Third National Bank and informed Buzz that the Motlow heirs were going to sell Jack Daniels and Sam, who was brokering the deal, had decided that Buzz and his dad, Lipscomb Davis should be the new owners. For those who knew Mr. Fleming, such a decree doesn’t seem at all out of line. In the years after World War II, Sam Fleming seemed to breathe life into Nashville’s stalled business community, still suffering from a combination of the Great Depression and the collapse of Caldwell and Company in the late 20s. Truth is, it’s pretty unlikely that the Brown family will ever offer me Jack Daniels, but I took Buzz’s admonition to heart when I was given the chance to own my own start-up bourbon. You see, those who know me, know that if you were to take ‘passion’ out of the equation, there would be clothes on the ground and pretty much nothing else. For the things I am passionate about, I am really passionate about. I say all that because I am really passionate about both good bourbon and the reclamation and preservation of Civil War battlefields. 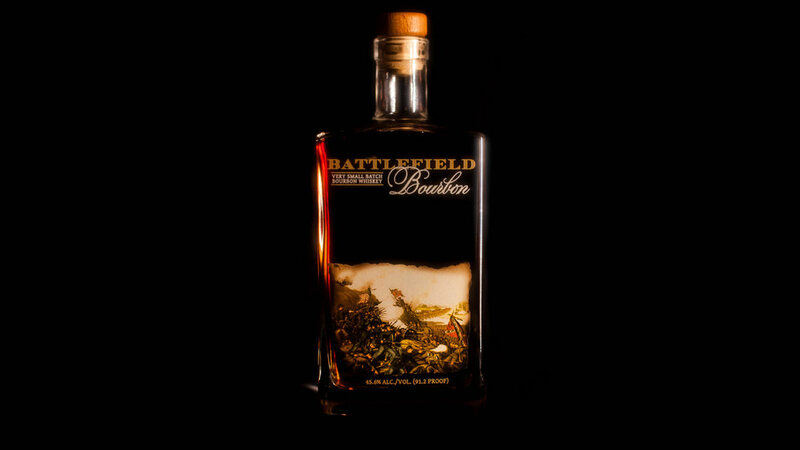 That’s why I started Franklin’s Charge, some twelve years ago in my dream of saving the Eastern Flank from development and that’s why I am now introducing Battlefield Bourbon to you. Seriously, how fortunate could I be? I get to produce really good bourbon – distilled, aged and hand-bottled, right here, in Tennessee and give a portion of all the profits to Civil War battlefield reclamation. I tell ya, I feel like I won the lottery of life – not just any lottery, but some Tri-State, Big Kahuna Lottery of Lotteries. For if I had a ‘bucket list,’ I’d be crossing a couple of things off of it right now. I could go on and on about tasting barrels, taking the spring water from the very battlefield where these boys, both from the north and south, suffered and died, about proofing it and then getting to design the bottle and coming up with our motto – Lest We Forget! – But, what really excites me is what should excite me when it comes to bourbon – the full body flavor of Battlefield Bourbon and how every bottle I sell will inch us toward our vision for the continued preservation for Civil War battlefields here and throughout the nation. My decision to only produce 1,864 bottles of Battlefield Bourbon this year makes it pretty much the smallest batch of small batch bourbon anywhere. Yet, it only seemed right as I promised myself that whatever I produced would be really good and really rare. Besides, as I am signing and numbering every bottle, I figured that I needed to protect the old signing hand and 1,864 bottles seemed like enough. Of course, 1864 is the year of the Battle of Franklin, which this sesquicentennial commemoration is all about. I’m glad I listened to Buzz’s story and his admonition. And even though there will only be 1,864 bottles of Battlefield Bourbon on the shelves this year, I feel some kinship with the Motlows and the Browns. There is something wonderful about producing really good bourbon and a bourbon with a purpose, at that. The experts in the business tell me that I should have tapped more barrels – that with so few bottles produced, it won’t last long. They say it will most likely be gone by the end of the year. But, then, again, that’s all right with me. After all, it took 150 years to get us to this sesquicentennial and, like Battlefield Bourbon, it will be over before we know it. So whether it’s the sesquicentennial or some really good bourbon, our only recourse is to take it in, savor every moment of it and remember it fondly. Lest We Forget.